Colorado Springs | Outlet Shopping Scoop. Never Pay Retail Again. Outlet Shopping Scoop. Never Pay Retail Again. Fashion Ambush with a Colorado Twist wraps up its first season on July 28th with Peggy Ziglin, the notorious Regional Fashion Advisor for the Outlets of Colorado and her Fox 21 News partner, morning reporter Craig Coffey completing their final fashion makeover at Outlets at Castle Rock. During their season, they’ve visited some of the coolest places in Colorado Springs and the Pikes Peak Region, while surprising one lucky person with a complete fashion makeover. If you would like to see the videos of from our past segments, click here. Over the last 6 months the two ambushed unsuspecting tourists at various Colorado Springs & Pikes Peak Region attractions but this time the fashion makeover won’t be so surprising. Why you ask? Because this time you can enter our contest at the comfort of your own home (or work). We’re taking applications (500 words or less as to why you or someone you know deserves a fashion makeover) now through June 22, 2011 at 12:00 noon. One lucky person will be selected from all of the received application and win a complete fashion makeover, valued at over $1,000.00. A fabulous fashion wardrobe from Off 5th Saks Fifth Avenue at Outlets at Castle Rock. Hair and makeup transformation courtesy of the trendy (and ever so cool) STYLE Salon team. Fashion tips on looks best for you. Your Fashion Makeover is valued at $1,000.00. 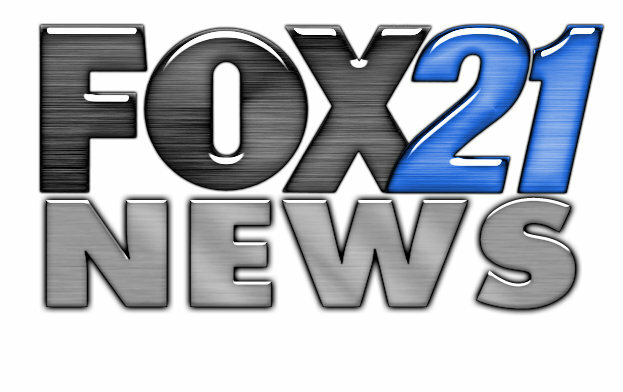 Your makeover and story will be featured on FOX 21 Morning News in Colorado Springs. CLICK HERE TO DOWNLOAD AND PRINT YOUR APPLICATION. To enter simply complete the application form and then bring the form along with a non-returnable photo of yourself to either Outlets at Castle Rock, Outlets at Loveland, or Outlets at Silverthorne’s Customer Service Desk. Application and photo must be received by 12 noon on Friday, July 22, 2011. Winner will be notified on July 23, 2011 and must be available for filming on July 28, 2011 at Outlets at Castle Rock. You can submit yourself, a family member, friend, co-worker, or anyone you know that you feel needs (and deserves) a complete fashion makeover. Get your application and photo in today. Contest closes at 12 noon on Friday, July 22, 2011. Fox 21 News, Colorado Springs Convention & Visitors bureau, and Style Salon just finished our pre-Fashion Ambu sh brainstorming with the team (Outlets at Castle Rock, Outlets at Loveland, and Outlets at Silverthorne). 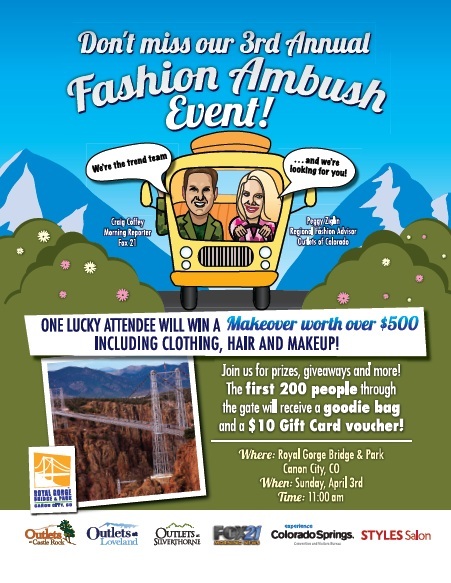 We’re ready for our next Fashion Ambush on April 3 at the Royal Gorge Bridge & Park and you could be our next makeover. Just plan on visiting the Royal Gorge Bridge & Park on Sunday, April 3, 2011 (if you’d like to win free admissions tickets to the bridge/park visit any of the Outlets of Colorado’s websites – see above – and enter your name into our contest) and around 11 am we’ll be selecting our next makeover person. One lucky person will win over $500 makeover that includes hair, makeup and clothing and the first 200 people to our booth (where we’re giving away awesome goodies and prizes) will take home a goodie bag that include fun gifts, coupons, and a $10 gift card voucher. Do You Need A Fashion Makeover? Are you still putting your makeup on the same way you did when you were back in High School? How about your hairstyle or wardrobe for that matter. We could all use a fashion makeover to help us reignite our fashion look, but it can be an expensive adventure. Well, Outlets of Colorado is going to change that! This Sunday, January 30, 2011 Outlets of Colorado will be giving away a complete makeover (valued at over $500 bucks) at the Mountain View Restaurant inside Cheyenne Mountain Resort. We’ll be at the restaurant during their fabulous Sunday Brunch (click here for reservations) and we will select one lucky guest to win our Fashion Ambush Makeover! Your fashion makeover will be captured on TV by our friends from Fox 21 and aired on TV for everyone to see your amazing transformation!. The one lucky makeover winner will be our first in a series we are calling Fashion Ambush, with a Colorado Twist. Outlets of Colorado (Outlets at Castle Rock, Outlets at Loveland, and Outlets at Silverthorne) have teamed up with Fox 21, Styles Salon, and the Colorado Springs Convention & Visitors Bureau to spotlight area attractions in Colorado Springs and the Pikes Peak Region and to do fashion makeovers around these fantastic destinations throughout 2011. Our first stop, Cheyenne Mountain Resort, a beautiful destination in Colorado Springs. We will be at the Mountain View Restaurant within the resort and we will be selecting one lucky person enjoying their Sunday Champagne Brunch. Outlets of Colorado and Fox 21 will be on hand from 11:00 am to 2:00 pm. To make your reservations for this Sunday, please call 719-538-4060. See you in Colorado Springs. In 2011 Outlets of Colorado will be up and down I-25 working our fashion magic. 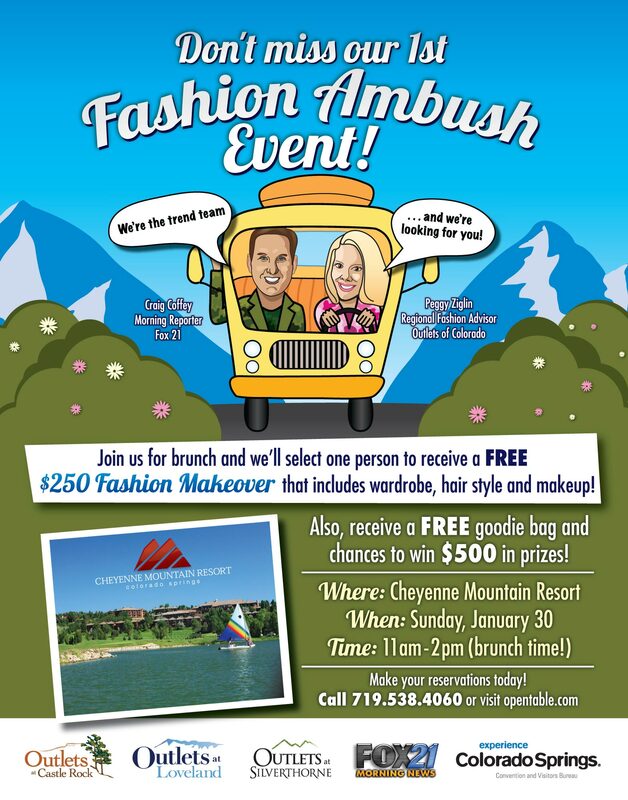 On January 30, 2011 Outlets at Castle Rock, Outlets at Loveland, and Outlets at Silverthorne will launch The Fashion Ambush with a Colorado Twist. It’s our newest fashion makeover adventure and with the help of my sidekick Craig Coffey, morning reporter on Fox 21 television, will be “ambushing” unsuspecting individuals each month in 2011, at a variety of tourism attractions in Colorado Springs and the Pikes Peak Region. The first Ambush is planned for Sunday, January 30, at Cheyenne Mountain Resort during their Sunday Champagne Brunch at the resort’s signature Mountain View Restaurant. One lucky diner will be selected for an on-site restyling. The winner is rewarded with a makeover valued at $500 and awarded additional prizes such as a two night stay at Cheyenne Mountain Resort. Ambush subjects receive a wardrobe from the Outlets’ designer retail stores like Off 5th, Ann Taylor and CAbi, a complete expert hair style from Styles Salon, professional makeup and fashion advice. The process is documented on film before, during and after the Fashion Ambush and the resulting three-minute video segment will appear on Fox 21 for several weeks– until the next Ambush occurs. I’m thrilled with our year-long Fashion Ambush program because we’ll provide information, entertainment, education and advice for Colorado shoppers on how best to maximize their dollars and their look, by shopping at the Outlets of Colorado in Castle Rock, Loveland and Silverthorne. If you’d like to have the chance for a new makeover (valued at over $500) then you’ll need to be down at Cheyenne Mountain Resort during the Sunday Champagne Brunch. To learn more about the fabulous brunch they serve, click here. If you’d like to win a pair of tickets to the Champagne Brunch on Sunday, January 30, 2011 then click over to Outlets of Colorado’s Facebook page, click on the Brunch for 2 and enter your information (while you’re there if you haven’t “liked” us…you should…because we like you)! Ambushing an unsuspecting consumer each month at various Colorado Springs and Pikes Peak Region attractions is going to be a blast. With the help of Fox 21 we film each entertaining and authentic episode, sharing how Coloradans can be both budget-conscious and stylish. See you at Mountain View Restaurant at Cheyenne Mountain Resort on January 30th. Fashion Update for the Denver Broncos Fan. Cool Outlet Fashions Just Got More “Everyday”! Can You Find These Dogs A Loving Home? 5280 Magazine Blog – Our Favorite 5280 Magazine is hot! We love this blog about all the happenings in the Denver Metro Area. People in New York are Beautiful! Everyday New York Fashion. I love this blog. What these people in NY wear you can find at the Outlets of Colorado. the it list – fashion & trends A cool blog that we follow because it’s nice to see hot fashion online and then walk out and about the Outlets of Colorado and see the same styles for less. Vintage Clothing Blog for all things Vintage. This blog is beautiful. The pictures are amazing! Events at Outlets at Castle Rock Events at Outlets at Loveland Events at Outlets at Silverthorne Fashion Ambush 2011 General Shopping Message Holiday 2010 Events Look Here! Peggy's Fashion Trends Smart Shoppers Uncategorized Wow Deals You're Not Going to Believe This! Outlet Shopping Scoop – Never Pay Retail Again!